The Swing Ride looks like a colorful giant basket of flowers. When the basket is running, the pneumatic device will highly hold up the long arms with cockpits, then slowly falling. When the long arms do alternating motion,the flower basket seems to have become a Chrysanthemum in full bloom, which constantly changes the color. Cockpits swing with the rotation, just like a childhood swing, as if to return to the childhood, achieve your dream in childhood. It is a large entertainment machine,which makes the cockpits spin around the cylinder center by using the comprehensive utilization of external force. 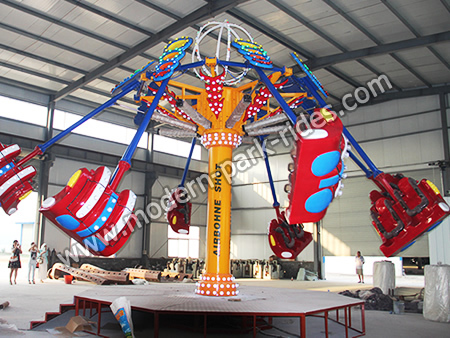 Passengers rides on the equipment which spins in mid air, immersed in speed pursuit of pleasure. The centrifugal feelings of alternating will bring you thrilling, exciting, as well as a relaxed feeling, leading you to endless aftertastes.